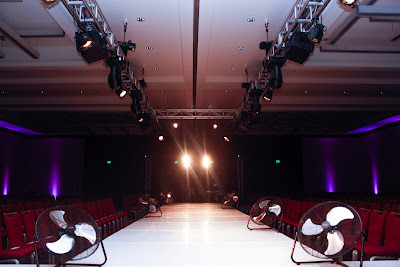 Kevin Murphy Hairshow | Entire Productions, Inc.
We constructed the catwalk and installed a flying truss system for runway lighting. We did all of the audio and flanked each side of the stage with video screens complete with live image video switching so attendees in the back of the house could have a great view of the styling on the catwalk. Dylan McIntosh did an amazing job producing the technical aspects of this event, that we've been asked to do the rest of their shows this year! Would have loved to see our EP-AV crew strutting the catwalk!!!! Here you can see the live video feed on the big screen at the top of the runway!